Ask any computer historian, and they’ll tell you the Altair 8800 was far from the first personal computer. However, they will tell you that the Altair 8800 was the first commercially successful personal computer, and is widely recognized as the spark that ignited the microcomputer revolution. Micro Instrumentation and Telemetry Systems (MITS) was formed in 1969 by two men serving at the Air Force Weapons Laboratory at Kirtland Air Force Base: Ed Roberts and Forrest M. Mims III (a personal hero of mine.) Those two men, along with Stan Cagle and Robert Zaller, decided to use their electronics background to produce small kits for model rocket hobbyists. The business was successful and it had articles published in Popular Electronics. While the business moved from model rockets to calculator and test equipment kits, Ed Roberts bought out the rest of the owners. In 1974, Art Salsberg, the new editor of Popular Electronics magazine was feeling pressure from Radio-Electronics magazine (which had many former staff from PE.) R-E just had a cover story in July 1974 featuring the Mark-8, an 8008-based microcomputer. Salsberg knew he needed to find a real computer system for their cover. MITS had an ally in PE editor Les Solomon, who had been introduced to Ed Roberts by Forrest Mims, occasional PE contributor and MITS founder. 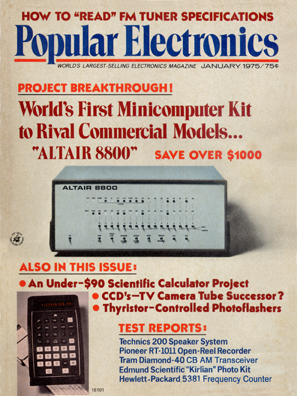 PE looked at several possible computers, but narrowed the choice down to what basically was an 8008 “computer trainer”, and the promise of an 8080-based computer, currently in design by MITS. Even though the computer trainer was nearly a finished product, ready to go, Salsberg felt the 8008 was “an about-to-be-phased-out chip.” and would be a step down from the Mark 8 already published by R-E. They wanted a complete kit in a professional-looking enclosure, and looked to MITS to create that for them. Roberts was working on the Altair 8800 at that time, but was nowhere near completing it. Solomon phoned Roberts and dangled the cover story, with specific requests – that the computer be sufficiently powerful, have an attractive, professional looking case, and sell for less than $500. Roberts agreed that he could meet the requirements and make the deadline. “The next step was finding a catchy name for our 8-bitter. After dinner one night I asked my twelve year-old daughter, who was watching Star Trek, what the computer on the Enterprise was called. Despite the excitement at MITS and Popular Electronics, Roberts, even at his most optimistic, thought they could sell 800 units (they needed to sell 200 units to break even.) MITS was surprised to receive over 1,000 orders by the end of February, and over 2,500 by the end of May. MITS was overwhelmed and could not fill orders in a timely manner. However, when they asked after 30 days if customers wanted refunds, everyone decided to wait. No one knows for sure how many Altair 8800 computers were sold, but Ed Roberts has said he sold 40,000 units before selling MITS to Pertec and leaving the computer business in 1978. But what could you actually do with an Altair 8800? An original Altair 8800 at the Computer History Museum in Mountain View, CA.